We were thrilled to be part of a very special 18th Birthday Party in Newmarket recently. 150 guests attended this distinctive and chic celebration, where the elegant interior reflected a strong Italian feel. Daring to go against the normal black starlit nightclub interior widely used for 18th parties, we were able to show that taking risks can pay off! We used a flat lining ivory marquee on 3 meter high legs. We kept all the colours neutral, from the linings, to the carpet to the table linen to the dancefloor. 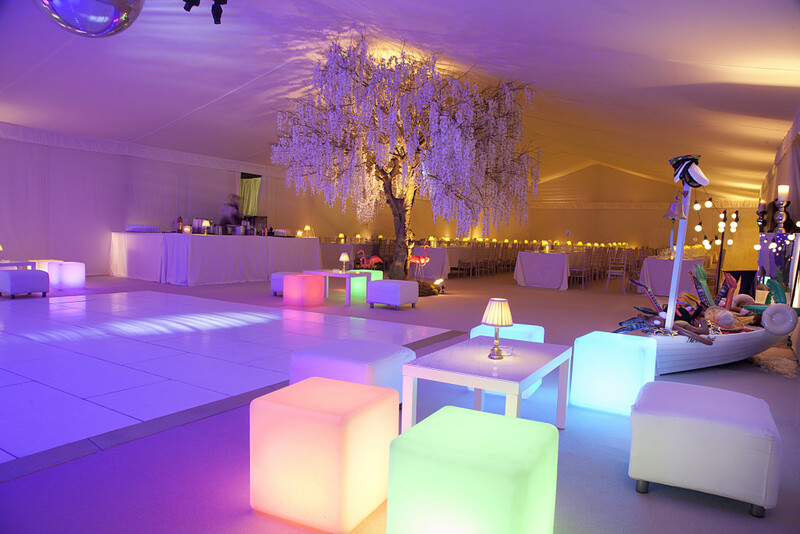 We then injected thousands of candles, ambient lamps, funky coloured LED cube seats and a master install of lighting production over the dancefloor which brought the marquee to LIFE in THE MOST magical way. The WOW factor was the life size blossom tree which we installed in the centre.